Disclosure: I received a review copy of the DVD, but all thoughts and opinions are my own. If you walked out of a 2014 showing of Big Hero 6 craving more of the superhero team from San Fransokyo, you are in luck! The animated series inspired by the critically-acclaimed Walt Disney Animated Feature is back on Disney Channel this summer, and to catch you up, there’s even a DVD compilation with the first seven episodes of the hit series. So gather your superteam together for Big Hero 6 The Series: Back in Action! Picking up immediately after the events of the film, young genius turned superhero Hiro Hamada thinks his robot best friend Baymax is gone for good. That is, until he discovers Baymax’s one of a kind personality chip designed by Hiro’s late brother. While attending the San Fransokyo Institute of Technology, Hiro tries to balance his education with reconstructing Baymax. 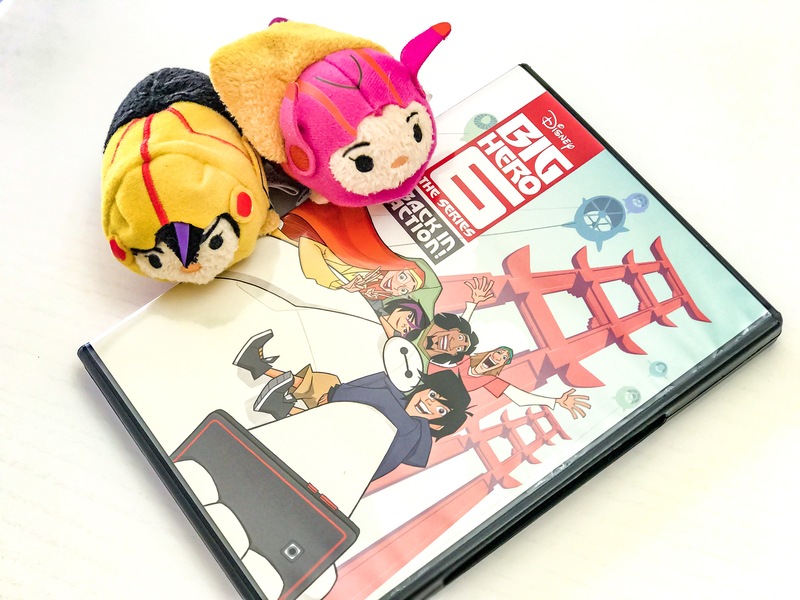 And when mysterious criminal forces start to descend on peaceful San Fransokyo, Hiro, Baymax, and the other “super-nerds” of Big Hero 6 decide to spring into action again to keep the streets safe! Over the series’ first six episodes and 44-minute Disney Channel Television Movie, the team is forced to battle foes of all shapes and sizes, from villainous robots and Glob Monsters, to Ninja Chefs and evil Pop Star duos. The series brings the audience back to the alternate version of San Francisco fused with Tokyo, Japan, creating its own unique style and characters. The animation style itself is changed from the film’s typical computer animation to traditional hand-drawn animation, giving it a signature “anime”-type feel. But this traditional style does not slow down the neon-laced chase scenes and robot-powered fight scenes one bit. Nearly the entire cast returns to voice the characters they originated, such as Scott Adsit, reprising the role of everyone’s friendly, calm-voiced medical assistant super robot Baymax, and Maya Rudolph, who returns as Hiro’s Aunt Cass, from whom he does his best to keep his crime-fighting lifestyle a secret. New characters are also introduced throughout the run, including Princess and the Frog voice actress Jenifer Lewis, playing the hard-nosed new head of robotics at SFIT, who is determined to push Hiro to discover his potential; and the mysterious villain Obake, voiced by veteran Sherlock actor Andrew Scott. Also pay attention to see Marvel Comics founder Stan Lee in yet another cameo, reprising his role as the superhero father of Big Hero 6 team member Fred. The series is a fun and action-packed adventure, while still giving time to explore the team members of this diverse group of friends as they struggle to manage college life and learn how to be a team of brilliant heroes. With Big Hero 6 The Series: Back In Action!, it can be guaranteed that you will be satisfied with your care this summer!